Over Christmas, my niece asked me to read something she wrote for her blog. I had no idea it would impact and rock my world. She eloquently expressed something we walk through each day. Many of us don’t realize it. Many of us do but don’t feel safe enough to change. Raeley gives some practical yet profound statements. Hiding behind masks or personas is something that people from all walks of life do. I know that in high school I felt like I had to pretend to be like the other girls in order to to fit in, but even then, I still felt like I didn’t belong. I’ve seen my pre-teen little sister act differently around different friend groups. I’ve read about people that were married and had a good life, but since they were always pretending, they were miserable. In marriages we pretend. So many marriages are hurting but to the outside world, even to the kids, adults pretend – or are too scared to admit the truth – even to themselves. In churches we pretend. Oh how the church pretends to be Ok. Church should be our safe place, but often times it’s the scariest place to be. The place we wear masks the most. I have a testimony about this that I will share with you soon. Even with God we pretend. It all started with Adam and Eve and the fig leaves. Raeley has some good stuff to say about that! Every day is a battle. 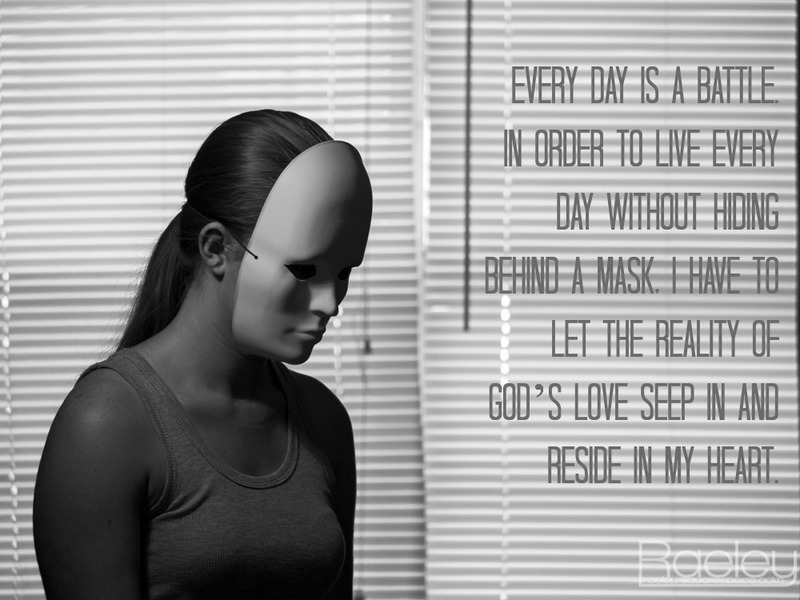 In order to live every day without hiding behind a mask, I have to let the reality of God’s love seep in and reside in my heart. You are loved so deeply by a God who covers you with His grace. Because when you take off your mask, maybe, just maybe the person next to you will take off theirs too. And what beauty you both will find. Thank you Angel! I struggle with being real. God has given some incredible people to practice realness with. I’m so fortunate. I can see her points, and they are good ones. But I have to differ on the church. While I may wear a mask with some of the people there, because I do not feel comfortable with all of them- I feel very VERY safe within the church, within the presence of God. I don’t wear a mask with God. How can I? He will find me everywhere and knows what lies beneath better than even myself. But as far as most humans go, oh yes, the mask is there the majority of the time with the majority of the people. Great post. Hmmm… I go back and forth on the church one A LOT. With God, I do unless I feel sinful or convicted. Even though I knows He sees me – and loves me – is delighted in me – I often get in between myself and God and put on a mask. At church, I do. I used to ALL the time, when I was at church where masks were the norm, but at my new church, it’s easier and easier to not wear one. It is so encouraging that you do not wear a mask with God. Thanks for your thought provoking comment!